When I first began talking with the Lord about this space, I was hesitant, to say the least. The thought of what it could be pushed me so far out of my comfort zone, deep into uncharted waters and un-explored territories, and I would be lying if I said I was okay with it (any other introverted extroverts out there know what I mean?). I was extremely excited about the potential, but as God began to cast vision for what it would look like, fear and doubt crept in. “God, who am I to share those things with others? I don’t know how to do that. I’m not qualified to speak that into people’s lives. So many others do and share the same things, and they’re far better at it than I could ever be! Maybe we should just let them do it.” Yes, believe it or not, I went there. Multiple times. You see, I have lived a lot of my life working hard to please others, doing my best to make sure that I didn’t disappoint them or make a fool of myself by failing and looking funny doing it. I haven’t always seen my value, and for years I have wrestled with feeling like I am just not as good as other people. Everyone else around me seems to have it all together – it must just be me. But as I sat on the couch last night watching THIS sermon from Steven Furtick, I realized that it is most definitely not just me, and it resonated with me so much that I couldn’t help but share part of the journey I went on to get to where I am now. I’m probably not the first person to tell you this, but the enemy likes to hit you where you’re weakest and most vulnerable. By believing his lies, believing that I wasn’t qualified, ready or capable, I unintentionally belittled and discredited what God was saying about me and calling me to do, and it wasn’t long before I had turned my passion for writing and desire for community into more of a fun hobby rather than a blessed and anointed calling. One of my favorite things about God, however, is that He is beyond gracious, and even while I was pushing away what He was giving me, I continued to receive ideas and vision for this space. My heart ached for the people in this world who had never experienced Jesus, and I longed so badly to do something about it. It was in that moment that I realized that that was exactly what God had been calling me to do all along, and it was like a tidal wave of revelation crashed down on top of me. I was awake, really awake, and it wasn’t long before I found myself asking God to show me more. 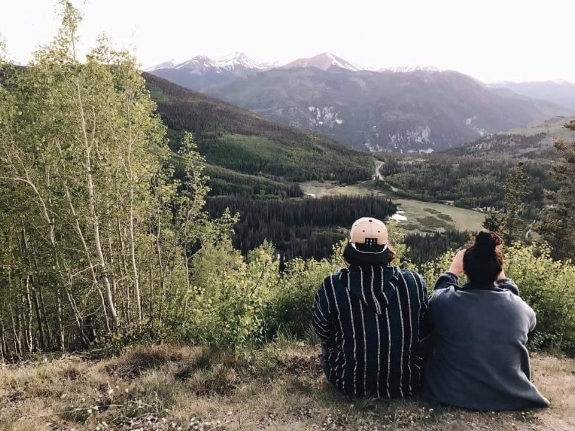 A couple of weeks later, my husband, Cameron, and I, along with 6 other amazing couples, traveled to Colorado for a couples Quest called Q1. It was on that trip in the wilderness of the mountains that I drew nearer to the Lord more intimately than I ever had before, receiving endless amounts of vision, clarity and revelation for the online ministry that would soon become Happily Ever Ginger. At various times throughout the first couple of days, I shared my desires and what the Lord had given me thus far, and, to my surprise, they were met with immense excitement, support and encouragement to move forward. I was thrilled, but still couldn’t quite shake the underlying thought that maybe once I got home and put everything into action, it wouldn’t be received as positively as it was in that moment. I wasn’t ready. I had no idea where to start, and greatly lacked the knowledge and resources to move forward. What if I did it wrong and people just didn’t get it or thought it was a stupid idea? That same night, one of the ladies knelt by me and spoke some of the most encouraging words I have ever heard. “God just told me to tell you that He doesn’t call the equipped. He equips the called. He’s calling you, and you’re ready!” I hadn’t yet shared how apprehensive I was about this venture with the group; how worried I was that people wouldn’t be able to see the same vision I had been seeing, let alone understand it or be supportive. I hadn’t yet shared that maybe this adventure was meant for someone else. But it was then, as she relayed those words to me, that I realized that it didn’t matter whether I thought I was qualified or knew where to start – I either trusted Him or I didn’t. I either believed Him or I didn’t. Y’all, the moment I had this revelation, identified the lies and relinquished control of the situation, I felt the most still peace I had ever felt with it, and things immediately began to fall into place. As unqualified as I may think I am, God is always right there to remind me otherwise. That week, the Lord lead me in such a way that I began to truly see my purpose and value in the Kingdom of Heaven, not as I see myself or as others see me, but as He sees me every second of every day. Now, I realize that for some of you, the thought of not believing your calling, believing that you’re good enough for it, or even questioning God at all is ludicrous. But I also know a lot of people who have walked through similar circumstances, not feeling like they’re good enough or qualified enough to do Kingdom work, especially the Kingdom work that God is specifically calling them to. The enemy will all too quickly target something that he knows is great and take it for himself, twisting and turning it until it’s unrecognizable, and taking you down with it. I’m here to tell you that you are more than enough! Your dreams and callings are not too big for you - If they were, they wouldn’t be yours. The things you see as flaws are completely invisible in the eyes of the Lord, and it’s not up to you to decide whether they disqualify you from your calling or not. God has already decided for you! Dear Friends, you don’t have to be completely ready for your life purpose before God starts using you. The Bible is full of broken, imperfect people that God used as Kingdom builders, despite their disobedient pasts. Yet, as Steven Furtick points out, if they hadn’t obeyed their call, written their words, spoken their sermons, prayed their prayers, and listened to the Lord, oh how different history would be! God doesn't just call the equipped, He equips the called.